Negotiations were opened with Gensoul about the possibility of handing over his Oran fleet to the Royal Navy, but came to nothing. 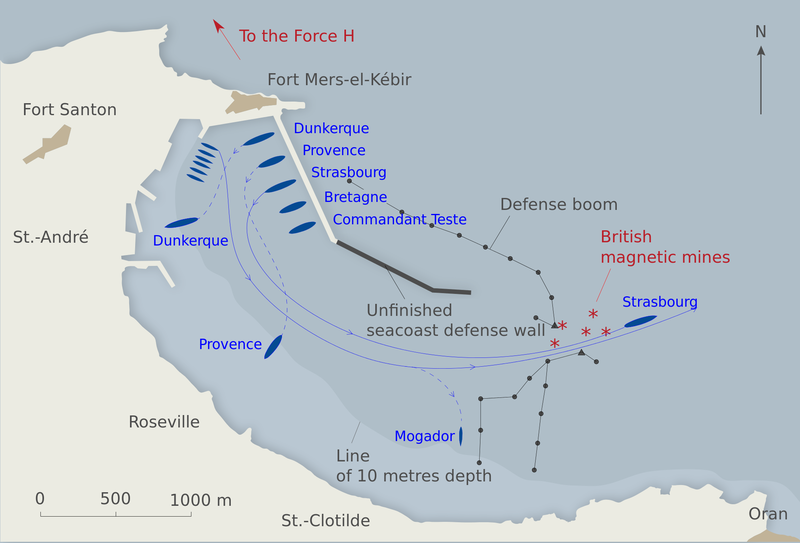 Churchill’s government therefore conceived a plan called Operation Catapult, in which the Royal Navy would use its influence to neutralise, by physical coercion if necessary, the French fleet at Mers-el-Kebir. The War Cabinet agreed that, at the same time as Catapult was implemented, the French vessels in Britain and Alexandria would either be seized or disarmed. That night, Pound and Churchill met in Downing Street to agree the ultimatum that Somerville would deliver to Admiral Gensoul once the Royal Navy arrived at Mers-el-Kebir. Four choices were to be given to the French. First, they could ‘sail with Britain and continue the fight for victory against the Germans and Italians’. Second, they could ‘sail with reduced crews to a British port’, after which their men would be quickly repatriated. In both these cases, the British promised to ‘restore your ships to France at the conclusion of the war, or pay full compensation if they are damaged meanwhile’. The third option was ‘to sail with us with reduced crews to some port in the West Indies – Martinique for instance – where they can be demilitarised to our satisfaction, or perhaps be entrusted to the United States and remain safe until the end of the war, the crews being repatriated’. But the fourth option was far more belligerent. If all these ‘fair offers’ were refused, then the French would be instructed to sink their ships ‘within six hours’. Failing that, Somerville was to warn that he had ‘the orders of His Majesty’s Government to use whatever force may be necessary to prevent your ships from falling into German or Italian hands’. These instructions were sent by Pound to Somerville the next day, 2 July. The climax of Operation Catapult was now approaching, as Force H headed towards the Algerian coast. Further east in Alexandria, Admiral Cunningham, thanks to his easy authority and his close relationship with the French admiral René-Emile Godefroy, was able to negotiate an amicable settlement, whereby the French ships were to be disarmed by having the firing mechanisms removed from their guns and their tanks emptied of fuel. In Britain the takeover of the French ships caused more friction. Most of the Frenchmen surrendered their vessels without any resistance, but the story was very different aboard the submarine the Surcouf, where some of the crew refused to obey the Royal Navy’s instructions and in the ensuing skirmish four men died. But the clash aboard the Surcouf paled beside the slaughter that was to unfold at Mers-el-Kebir on Wednesday 3 July. The advance part of Force H reached its destination just after dawn, and at seven in the morning Captain Cedric Holland, in the destroyer Foxhound, asked for permission to enter the harbour to negotiate with the prickly, status-conscious Admiral Gensoul. Holland handed over the letter with the British government’s four alternatives. Somerville, whose entire Force H had arrived at Mers-el-Kebir by noon, sent a signal to Gensoul, warning that no French ship would be allowed to leave the harbour unless the British terms were accepted. To show that this was not a bluff, he ordered a series of magnetic mines to be laid across the harbour entrance by Fleet Air Arm Swordfish biplanes from the Ark Royal. Conflict seemed inevitable. In the early afternoon, Somerville sent a further signal, warning the French that unless the conditions were accepted by 3.30 p.m., he would open fire. The French employed delaying tactics, hoping to spin out discussions until darkness descended, then try to reach Toulon. Meanwhile their ships were raising steam ready to go to sea and all their direction-range finders were trained on Force H. Tensions continued to escalate. After a further wait, Somerville sent a warning to Gensoul that unless the British terms were accepted by 5.30 p.m., he would open fire. The talks came to an end, with Gensoul confirming his rejection of the ultimatum and Holland returning to his destroyer. At 5.54 p.m., as soon as the Foxhound was clear of the harbour, the three battleships of Force H opened up from a range of 17,500 yards, launching thirty-six salvoes of 15-inch shells at Gensoul’s fleet, a total of 144 shells, each of them weighing three-quarters of a ton. It was one of the most concentrated, deafening broadsides in British naval history. The thunderous roar from the guns filled the bay, huge columns of black smoke from the explosions soon rising from the harbour, with the French guns, on board the ships or from shore batteries, making their own contribution. But Force H did not completely succeed in its objective. 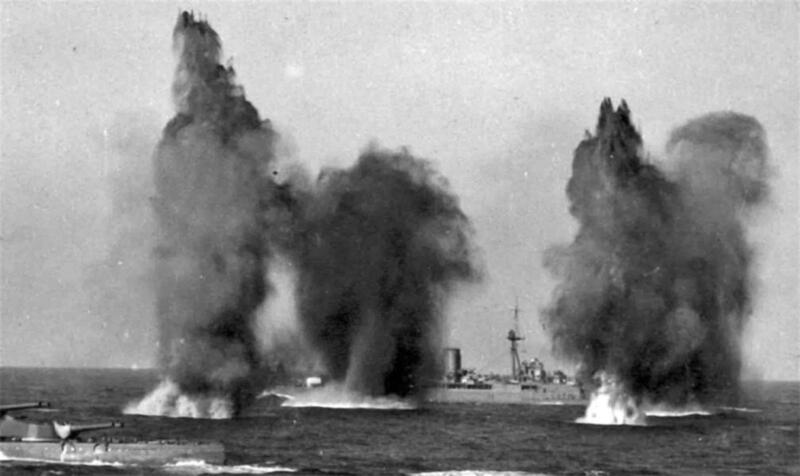 Despite the bombardment, the mine barrier and torpedo attacks from the Swordfish aircraft of the Ark Royal, the Strasbourg, two destroyers and three frigates managed to reach Toulon, having used the cover of heavy smoke to break out of the harbour. The importance of Oran was not so much in its practical outcome for the Royal Navy but as a symbol of Britain’s ruthless determination to continue with the war. Perhaps even more than Dunkirk, the attack on the French fleet dramatically improved Britain’s prospects of survival. Public morale was lifted, Churchill’s position was strengthened and the American attitude to Britain’s war effort was transformed. The Ministry of Information recorded overwhelming public support for the Royal Navy’s action, finding on 4 July that ‘this strong action gives welcome evidence of Government vigour and decision’. This mood was also reflected in the Commons, where the attitude of many Tory backbenchers had remained equivocal towards Churchill because of lingering affection for Chamberlain. But by showing his true fighting spirit, the prime minister won over all the doubters. For the first time since taking power in May, he had almost the entire political class behind him. When he reported on the action at Mers-el-Kebir, the reception the House gave him was far more enthusiastic than anything that had followed his great orations in May and June. In political terms, Oran portrayed Britain in a new heroic light, directly contradicting the stream of defeatist opinions that Ambassador Kennedy had continued to relay to Washington. This was crucial because it meant that the White House was now willing to circumvent the neutrality laws in providing all the support it could, particularly in the form of destroyers, aircraft and weapons. Most important of all, the encounter at Mers-el-Kebir had a dramatic impact on Hitler’s attitude towards Britain. No longer could he hold to the belief that the enemy was about to crumble.